On the morning of Dec. 7, Navy personnel largely ignored – and Army troops never learned of – full-blown evidence that an attack had been launched. The destroyer USS Ward (DD 139) sank a Japanese midget submarine in the mouth of the harbor at 6:54 a.m., but the staff of Adm. Husband E. Kimmel was not told until 7:25 a.m., and Army and AAF officers were never told. An Army radar station spotted Japanese aircraft at about 7:00 a.m. The only AAF officer who could be reached by the radar technicians decided the radar blips were B-17 Flying Fortresses arriving from the West Coast – there were four B-17Cs and eight B-17Es approaching, just 3 degrees off the heading of the Japanese warplanes – and alerted no one. At 7:53 a.m., the commander of the first wave of Japanese pilots radioed, “Tora, Tora, Tora,” the code words for a successful surprise approach, back to the Japanese fleet, and the attack began. At 7:53 a.m., the commander of the first wave of Japanese pilots radioed, “Tora, Tora, Tora,” the code words for a successful surprise approach, back to the Japanese fleet, and the attack began. The AAF in Hawaii consisted of the 18th Bombardment Wing at Hickam Field, the 14th Pursuit Wing at Wheeler Field, and a gunnery training detachment at Bellows Field. 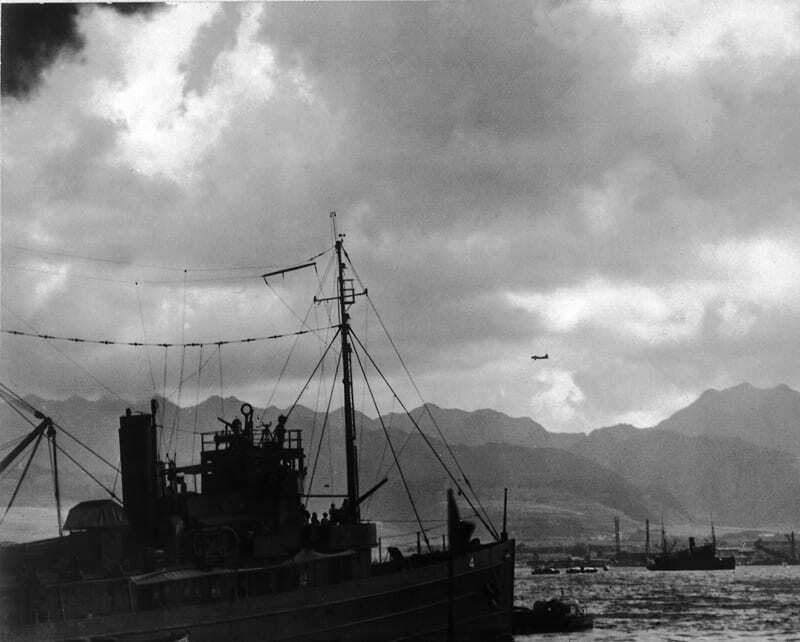 The nation’s air arm in Hawaii had 754 officers and 6,706 enlisted men. Short and Martin had bombarded Washington with requests for newer planes but had only 12 B-17D Flying Fortress, 33 B-18 Bolo, and about 12 A-20 Havoc bombers, 39 P-36A fighters, and 87 P-40B and 12 P-40C Tomahawk fighters. Most of these aircraft were unfueled and unarmed on the morning of Dec. 7, and most were inferior to their Axis counterparts. It did not help that, despite warnings that should have been heeded, the first wave of Japanese warplanes took Wheeler Field completely by surprise. The destruction of the AAF fields on Oahu was vital to the Japanese battle plan. Though the target of the attack was the Pacific Fleet, the Japanese did not want to engage in an all-out battle with Army and Navy pilots. Japan feared that long-range American aircraft could trace departing Japanese aircraft back to their ships. They wanted quick and complete destruction of AAF aircraft on Oahu to protect their carriers at sea. The Japanese targeted Hickam, Wheeler, and Bellows Fields. The initial attack struck Wheeler and Hickam Fields, destroying aircraft, maintenance hangars, and other structures. 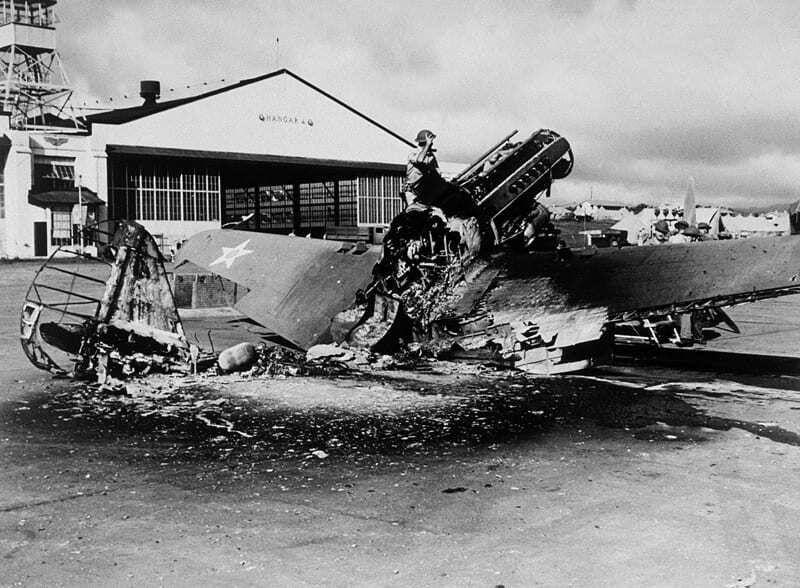 The base chapel, mess hall, and barracks at Hickam also suffered serious damage. A second wave of Japanese aircraft struck Wheeler and Hickam Fields about one hour after the first attack ended. The first American aircraft lost in World War II probably was a B-24A Liberator that had been brought to Hickam a few days earlier by pilot 1st Lt. Ted Faulkner. The first American aircraft lost in World War II probably was a B-24A Liberator that had been brought to Hickam a few days earlier by pilot 1st Lt. Ted Faulkner. The Liberator was being readied for a planned, clandestine photographic mission in the Pacific that would enable the United States to detect any offensive naval movements by Japan. Lt. Kunikiya Hira, leading No. 3 Squadron from the Japanese carrier Shokaku, toggled the bomb release on his Aichi D3A Type 99 “Val” dive-bomber. His bomb – the first to fall on Hickam – hit Hangar 15 and set fire to the bomber, the only B-24 in the Pacific (the AAF at the time had just 10 in the world). Two crew members were killed and three wounded, the first American casualties of the war. Staff Sgt. Burton R. Grinyer, the crew’s photographer, was walking toward the Liberator with two other members of the crew at the time of the attack. One man broke and ran and was cut down by another Japanese aircraft on a strafing run. A second went in another direction and was wounded. Grinyer figured that lightning couldn’t strike twice and dived into the crater made by the bomb. He survived unhurt. The 12 Flying Fortresses arriving in Hawaii amid the attack came to earth in all directions. 1st Lt. Harold Chaffin landed his B-17E at the small auxiliary field at Haleiwa. 1st Lt. Frank P. Bostrom made several attempts to land, dodged Japanese fighters repeatedly, and finally put his B-17E down on the Kahuku Golf Course. Those Fortresses symbolized good intentions on the part of U.S. military planners. They were en route to the Philippines, where the war with Japan was expected to start. The AAF planned to have four heavy bomber groups in the Philippines by April 1942, a formidable order of battle likely to withstand any assault the Japanese might mount. For both Hawaii and the Philippines, however, April 1942 would be four months too late. Half of the dozen Fortresses arriving in Hawaii that morning never flew again. My dad George F Swaney jr was suppose to at Pearl Harbor during the attack.He had a steel plate in his head from being wounded.Unable to determine if this is true or not.I am put togather a family note to pass on. Depending on what service he was in, you might search the list of casualties in the appendix of “7 December 1941: The Air Force Story”, or… the records maintained at the National Park Service for the Pearl Harbor sites. or here http://airforcehistoryindex.org/data/000/467/997.xml for the complete index entry. I have a PDF of the actual documents (not just the index) if anyone would like a copy.